Every strong computer language comes with conceptually useful mnemonics, and Rust is no exception. We use Cargo to build and crates to define dependencies. I'm just starting down the Rust rabbit hole, in anticipation of OSCON. So far: no regrets. Contemporary frameworks take for granted a canonical tree structure, with given paths, such as /target/debug versus /target/release in the case of Rust. Use cargo check more than cargo build, skipping the final step of building the executable. In some cycles, all you need to know is your code will compile. Actually running it is not a requirement, and indeed might slow down the development process. The idea of extending Python with Rust or even implementing Python in Rust someday, has of course crossed my mind. However I don't depend on this idea as a sole source of motivation, when it comes to wading in as a newbie. The humbling effect of wading in as a newbie has intrinsic value. However I'd prefer to explore a rabbit hole with a reputation, such as the one in Alice in Wonderland. One wishes for wonders, in exchange for one's labors. The term #camp has take on various connotations, however summer camp remains a ritual activity for families seeking activities for the kids when school is out. I went to a summer camp in Sardinia, when my family lived in Rome. I remember being homesick. My parents stopping by for a visit made it worse, though I'm glad they visited. The camp language was mostly Italian and my Italian wasn't very good. This year, I signed up with Saturday Academy to do another edition / iteration of what I call Martian Math wherein I converge science fiction, a little history, some astronomy, and the off-beat 4D stuff I learned from transcendentalists, Bucky Fuller in particular. I'm up front with the kids that I'm drawing from this source for what I call "martian" -- not a secret. Summer camp is not supposed to be grueling or any kind of unwelcome imposition on the customer. We're aiming to provide entertainment, and in a well equipped, well connected computer lab, with middle schoolers, that tends to mean games. My approach is to introduce each meetup with a short lecture when they're fresh, and then permit multiple activities. Quite a few opted to assemble C6XTY or try out Lux Blox. I also had a folding paper exercise, wherein we might assemble a whole Tetrahedron. 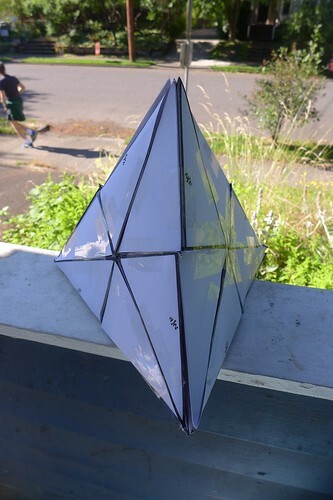 I didn't get enough interest for this last activity, but did have a completed tetrahedron already made. Again, I featured War of the Worlds as featured on CBS radio by Orson Wells and company. Today I played a 48 minute program in the background, covering that incident. Later I switched to showing Mandelbulb reveries. In both cases I kept the sound a relatively low volume and didn't mind if student attention were focused elsewhere. This morning's lecture featured the number series 1, 3, 6, 10, 15... (triangular numbers) along with the tetrahedral 1, 4, 10, 20, 35... (cumulative), both found in Pascal's Triangle. Then 1, 12, 42, 92... took us to the On-Line Encyclopedia of Integer Sequences and the link to my web page on the the Microarchitecture of the Virus. There's a tie-in here, to War of the Worlds, as it was microbial life that eventually brought down the Martians, otherwise the humans would surely have perished. The stereotype of a Protestant is one who protesteth that he's working all the time, because of the Work Ethic thing, where you're a burden on the King if you don't serve His Royal Court in some way. One must justify one's existence, as jurisprudence in this jurisdiction dictates, omni omni Latin Latin yadda yadda, Amen. When New Math came out, as we saw in Incredibles 2, parents felt hard pressed to keep up and help with homework. Parents not knowing any of what junior brought home as assigned labor ("homework") was undermining of their authority. The head of household needed to establish basic mathematics competence in the eyes of progeny, given the insistence on maths as a Cold War necessity (Incredibles 2 is set in the 1960s but is entirely innocent of political war-making, unlike the backdrop for Black Panther). Speaking of both Wonder Woman and Black Panther, I'm back with the Ottoman Turks reliving the final days of the British Empire. So really? Ireland and India color-coordinated their respective flags? Both were striving to gain egress. Iraq, newly taken, along with Persia (Iran) and Kuwait, were also chafing to establish a more localized sovereignty. Iran was actually not part of the UK, just the oil deal was highly favorable to BP or whatever they called it back then. I've also been studying the Opium Wars, which is relevant in light of the American opioid epidemic. So Physics has its own meaning for Work (W) in terms of energy, with units of productivity and throughput, along with Big O notation in Computer Science (CS). As a hominid, we burn calories at about the rate of a light bulb, but we're not all doing the same processing, in the sense of Process Work (I've been attending workshops downtown). By analogy, not all CPUs or GPUs are running the same jobs, an obvious point, but when considering raw power in a "plugged into some hydro dam" sense, there's a tendency to overlook just what exactly the power is used for (usually a long story). What if families were under time pressure to learn GNU stuff in a hurry, as in bash (Bourne again shell) and other POSIX type stuff? A lot of them are. Dads and moms everywhere are wading into bash, a gateway shell environment. Much of the working out is not directly compensated, and in fact people go into debt seeking these skills, having been promised a shovel at the end of the rainbow with which to dig themselves out of their financial hole. Many retirees are counting on those student debt backed annuities. So how is the Global U, going forward, planning to teach about Work both in the Protestant Christian sense, and in the more secular sense of Higgs Boson (God particle) physics? Thermodynamics enters in. Climate science. Concerns about plastic in the biosphere. Thinking globally, while acting locally, is not something one consciously chooses to do, necessarily, which is why "Think Globally. Act Locally" is less a moralizing enjoinder and more just a label on the box, especially where billionaires are concerned, processing financially as it were. Is that work? The pressure to learn New Math had to do with maybe those Communist nations pulling ahead, now that they had the full support of their Proletariat base classes. Capitalism needed to prove itself through its superior university system, and the University of Chicago was up for the fight. SMSG (the official name for New Math) would introduce the missing rigor required by Academe of its best and brightest. I was a guinea pig for this project, one of many, until extracted and landed in a British facility, with coat and tie. However, as students of Systematic Ideology well know, political ideologies tend to have a short half-life, morphing into one another (quantum physics like) with Marxist Russians nowadays presenting as Eastern Orthodox, or some other Byzantine variant of what was once Emperor Constantine's official religion for the Roman Empire. Protestants have lost some of their shining lights to this competing branch of the One True Faith (OTF). The Ottomans were planning to follow Rome's model, but using Islam as an engine, in place of Christianity. They were semi-successful I suppose one might say. I'm still catching up on all these stories, and I haven't even started on Game of Thrones. The question is "what Work is productive?" and in which namespace are we, when asking that question. What "work" is merely Entropy in disguise? The water would have flowed downhill anyway, but you're charging me for this "service"? This line of inquiry invariably plunges us into Information Theory, Thermodynamics (again) and of course GST (the general theory of systems). Would it behoove the Seattle economy to invest in luxury cruise submarines that take people to undersea gardens and even SeaWorld Resorts? Or would that make less sense than extending the monorail, which I gather continued to see service after that mixup with Elastagirl (Incredibles 2 allusion). Investment bankers decide which science fiction scenarios deserve their reputations and savings, be those autonomous vehicles (and required infrastructure), Hyperloop, hotel submarines or whatever. Seattle does have a history of building submarines already, as well as hosting a World's Fair. Fewer people remember the Spokane Expo, making for two such events in the same Union state. Oregon hosted a giant world's fair type expo as well, in 1905, called the Lewis & Clark Centennial Exposition. Oregon had joined the Union on Valentine's Day, 1859. Microsoft has shifted a lot of its weight over to Github for a reason: collaboration on software projects is a way of life for many of its most productive developers. Like I'm these days hacking on a next iteration of Martian Math for Silicon Forest clients. PayPal was talking about Inner Source. The culture has benefitted greatly from the productivity of the GNU era engineers, once their best tools were escaped (freed) from the grip of IP lawyers. Or rather, a new brand of IP law challenged an older set of schools for intellectual dominance and carved out some turf. Linux would make a splash as the darling of the Dot Com revolution, only to take up residence in the cloud as a premier cloud service, long after Dot Com at ceased to be as much of a thing. What I'm saying is the dad in Incredibles 2 is tackling a hard job in reprogramming himself to think more like a New Math teacher (Tom Lehrer et al) and parents continue to face a steep wall in the homework department, with Learning to Code a new kid on the block. Nowadays we're pummeled with messages about the importance of coding to a child's future, but without much attempt to provide parents with the necessary background. That's all changing of course, plus many parents are already techies and/or hobbyists leading the charge. The point is: learning to code is hard work. Even before the cartoon begins, we got a brief promo from some of the voice actors acknowledging a gap of fourteen years between the original in 2004, and this sequel in 2018. That promo may be just for theaters, dunno if you'll see it on the DVD, in front of the main feature. The movie opens right where the last one ended and pursues the same themes. The Mole, by the way, is never caught (spoiler alert), is simply forgotten about. He gets away with his crime whereas superheroes are framed by the media as the bad guys. The public seems awfully gullible, as usual, as if it weren't obvious The Mole was a serious threat. The Mole's methods of destruction are reminiscent of urban legends around Nine Eleven, which focus on gold stolen from deeply buried broken-into vaults. Superheroes did not materialize then either. Firefighters did, heroes of the real kind. Interestingly, it's the billionaire elite who want to bring a nearly homeless family, ensconced in a motel with only two weeks unemployment left, back to prosperity. The kids are ecstatic to receive the charity of a billionaire's extra home, while mom goes to work in a PR capacity. She and the Bezos character will restore the reputation of superheroes everywhere. There's a funny Peter Sellers allusion given the control panel in the fancy house. Remember "birdie num num" in The Party? Here it's "cookie num num". Bezos and his sister have a batman-like story of how their dad was murdered by bad guy intruders. Instead of retreating to the panic room, ala Jodie Foster, the dad tries the two "bat phones" representing faith in superheroes and is let down. The sister has never forgiven this decision and blames the Cult of Superheroes for plunging people into unreality and faith in imaginary friends ala Waiting for Superman. Her screen-slaver persona plays a double role: as a superhero through technology (not unlike in Incredibles the first) and as a prophet reminding people of their life in The Matrix, as slaves to screens. The Screen Slaver tries to talk us out of our blind trust in the vicarious existence screens give us, while at the same time enslaving us with that same power (hypnotism). The sister has got a point. An audience of rapt movie-goers stares at the Disney movie, hypnotized, while the villain tries to break the illusion and push us back towards our own lives, wherein superheroes are not illegal, they simply don't exist. Since we're enjoying the dream so much by this time, and empathize with the homeless family, now so much less hopeless, we resent the villain for trying to break Disney's spells. We root for Bezos, the billionaire, and by extension for Hollywood and Pixar. We want to be hypnotized. We appreciate the billions that go into providing us with this virtual reality, wherein magical superpowers do indeed seem real, thanks to the miracle of telecommunications and computer generated graphics (plus audio). We've paid our admission and are entitled to this experience. May the good guys win. The movie seeks to perfect a recent era, wherein the FBI consisted of apolitical men in black and New Math was proving frustrating to parents. Government plays a minimal role in this world. An ambassador Merkel type character represents some kind of global social order. A supranational global elite controls the superheros despite the latter's special powers. As good guys, the superheros are constitutionally law abiding. They obey the law because that's the right thing to do, even if that means working for an insurance company. With great powers comes great docility. Clark Kent would understand. 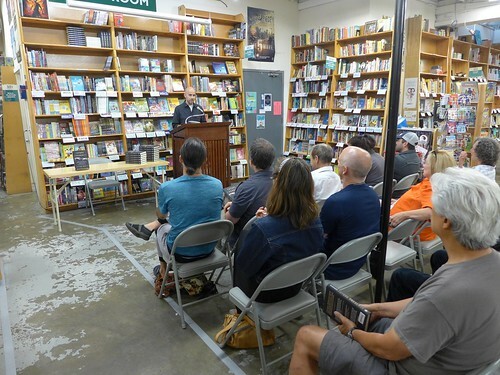 In keeping with the movie's theme, my next stop after Bagdad was the Powell's Books across the street, where Peter Rubin, an editor for WIRED, was sharing readings from his new book Future Presence about VR and the intimacy it promises. 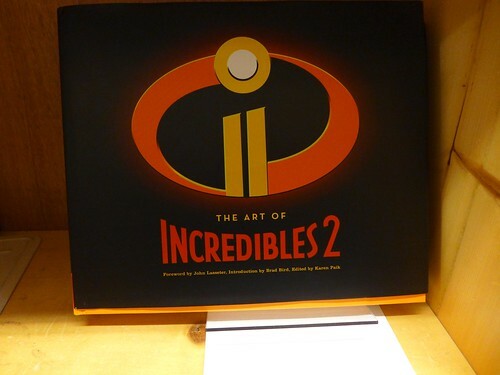 A book about the artwork in Incredibles 2 was already on the shelves. We may feel divided and isolated by social media today, as our smartphones intrude on actual real time relationships, with the people in our immediate vicinity. However VR might cure all that, by making the virtual world at last as satisfying as the real one. Screen Slaver has the potential to hypnotize us to an even deeper level. 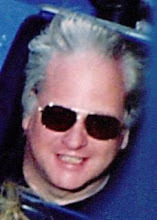 Disney and Pixar will be right there with us, along with FANG, helping us believe in The Matrix, as we fly around the world meeting with each other in Cyberia, super beings at last. The Global University is highly militarized and low on people skills, which means it's somewhat weak in the brains department, or "mentally deficient" as we say in the business. Long story. In terms of funding, the talented scientists and engineers need to represent their research foci against a backdrop of Endless Wars, as that's the lifestyle most students see as realistic for themselves. How will my research help on the battlefield? Metaphorically, we're always able to see War when we need it. President Johnson tried his War on Poverty, but then how was that going to profit Big Business? What followed was a War on Big Government in order to stop it from FDR style experiments with so-called "socialism" (the irony being the military is highly socialized, in addition to being not democratic). The Business Plot, at first frustrated by Smedley Butler, won out. 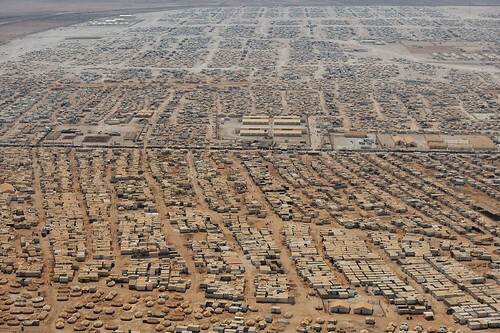 One consequence of Endless Wars, with its belief in "regimes" and "regime change", is an endless stream of refugees from the bombing ranges the Global U selects for fairly indiscriminate flattening and rubblizing. As faculty knows: we're a bit weak in the head. Student housing, being destroyed over there, needs to be reconstructed over here, in the form of refugee camps and the Global U is starting to train people in the many skills related to setting these up and providing management and materials. We're looking at large logistics challenges, especially around supplying the basics, such as WiFi. GST has been helpful in linking all of the above to the Earth Energy Budget (EEB) at least conceptually. Exactly how currencies come to represent current, in terms of kilowatt-hours, is another discussion. Think of energy as gold bars and of the sun as their place of origin (we import more energy from the Sun, as a planet, than we do from all the oil fields combined). Another branch of study the students are going into: weapons inspection and disposal. Those making bright shiny new weapons often have an investment in retiring the old ones the sooner the better. When conversion is a possibility, in rare cases, only a systems based approach will graph out the consequences and provide anticipatory programming. My network of "spy camps" (derogatory) was envisioned with similar goals e.g. testing lifestyles with a degree of self-sufficiency even in a remote wilderness. Campus facilities employing XRL (extreme remote livingry) have an ephemeral quality. The entire campus is designed to vanish without a trace after the research data has been collected. Permanent infrastructure may be left behind in some cases, but minus the campus that put it there. I'd like to write a Medium essay on this topic, of Heaven versus Reincarnation as two belief systems that philosophers sometimes just assume are opposed, even though both feature an After Life in some sense. The devil is in the details right? However, I'm in a hellish state of needing to connect to a virtual classroom on Monday, for hours at a time, and I've been depending on my Android doing Bluetooth for that purpose. However, the Android appears to have gone crazy. Not the first time. Fighting to save the Android's sanity is taking a lot of my time. That's the thing about Heaven: it comes with a flip side or Hell. If you wake up in some After Life, you're going to wonder what the Judgement was. Yes, I know, we're not all on the same page as to the timeline. The orthodox Christian belief is we need to stay dead until the end of time, at which point, we experience the Resurrection. What may confuse people is that's apparently not how it worked with Jesus. He could be resurrected as a fully formed adult, just days after he was entombed. Did he look the same though? Some accounts say only his closest disciples were able to authenticate that this was the same guy. I diverge though. Or maybe not, as I'm wanting to highlight that the legends or myths are already murky. Judgement Day has to wait for a Second Coming. Is there a Heaven without that Judgement Day coming first? In the archetypal realm, this is already the After Life. We've died and been reborn many times, and each time we're born, we get a lot of what we prayed for. The living standards humans enjoy now are pretty good for some, totally miserable for others. We regard Creation as both Heavenly and Hellish, but ultimately neither because not Eternal. What would Heaven be like then? You have a body? What if you think others are better looking? Are you condemned to jealousy, envy and so on? That would be Hell right? You keep suffering from the same sins you did before, except eternally. There's Karma in this picture, it seems like. Here's an After Life, which you expected to be Heavenly, but once you get there, what do you get to do? Do you have a job? Is your life meaningful? Getting to a world that still made sense, had a history, a narrative, or set of narratives, would seem a Heavenly Outcome to many, especially if said world were relatively free from want and diseases, compared with some Hellish world one had just been in. A believer in reincarnation prays for a better After Life. How is that so different from a believer in and/or hoper for Heaven? In sum, I do not buy the idea that we have any strictly necessary division in namespaces, between those dreaming of Heaven, and those praying for an After Life on Planet Earth or some other planet. What both believers have in common, in addition to aspirations for a brighter, happier future, is a sense of continuity. How will we know "this is me"? Is one cogito as good as any? That goes against our sense of having a self to preserve. Now we're getting into another sticky area in philosophy: continuity of self. Those into reincarnation sometimes claim to have memories from past lives. However, beliefs do not always bend in response to such claims, as those not believing in reincarnation may nevertheless believe in dreams, fantasies, thoughts contrary to fact. "Sure you claim to believe in past lives, but that doesn't mean I have to believe you had any" is how the reasoning goes in that case. And so for many claims people make. My claim is simpler: belief in an After Life includes belief in Heaven/Hell and belief in some future lifespan in any context, comes under the same umbrella. Those positing a strict separation between these two belief systems are being unnecessarily strict in my view. In contrast, some believe in No Before Life, and No After Life. The cogito does a "heads up" in a single lifespan, experiences the mystery of Being, and then reverts to Non-Being, which is not, after all, a state of Being. Saying someone "is" dead or "is" not yet born, is to posit a "someone" and that's where the oxymorons get started. Even here, I'd say there might not be as strict a dichotomy as we might think at first. To have another life while forgetting your previous life completely, suggests some underlying continuity that's deeper than one's memories and thoughts. That a specific ego might dissipate, never to reconstellate (reconstitute), is possible even in the course of an ordinary lifetime. A person you once felt and considered yourself to be, is now dead to you. There's no going back. This issue of Continuity (an important word in film) likewise arises for those who believe in Heaven. We expect to be reunited with our loved ones, in many stories. However that implies we recognize them, and they us. Did all the people we don't want to remember go to Hell? Does that mean we can't remember them in Heaven? Does their suffering not detract from our eternal satisfaction? Do we exult in it then? Some of us who study the Bucky stuff are likewise attracted to the mathematical research of Dr. N. Wildberger. (B) questions the ones a lot of us grew up with in the 1900s. At one point he says explicitly that his questioning of the dogma that Set Theory somehow provides logical underpinnings, is deliberately designed to bring mathematics more into alignment with computer science, wherein the Set is one data structure among many. Furthermore, computer science is resolutely discrete and content with Finitude, at least in some circles. Dr. Wildberger is, philosophically speaking, a Finitist. What I anticipate is the unwillingness of mathematics faculties to take on Learning to Code at the high school level is going to result in a corresponding loss of influence when it comes to preaching, I mean teaching, about mathematical foundations. Are we so sure we need "infinity" as a central concept then? Years ago, the National Council of Teachers of Mathematics (NCTM) changed its logo from something promising, an octet truss looking thing, to an infinity symbol. This could be interpreted as a symbol of self defeat, as we leave Cantor dust in the dust, so to speak. What's missing in our selection of a coordinate system is a sense of its frequency, scale, degree of resolution. The assumption is that any grid is immediately resting upon some continuum, that stable reality that makes "solids" solid. Even if we don't find much justification for such a reality in physics, many still believe we're able to access this continuum through some third eye (the "mind's eye"), and therefore the continuum remains an object of mathematical study. I'm not saying it shouldn't be, only that said eye might be critical (in the sense of skeptical).